Crunchy and crispy, with a touch of salt, potato chips are a wonderful, classic snack. Making potato chips at home can be a great experience and produces the freshest chips possible. Finding the perfect potato for making chips is about more than just the size, you have to take into account the type and quality of the potato as well. Potato chips are best made from the Solanum tuberosum species. In the grocery store, they are known as baking potatoes and are large in size. That said, nearly any potato will create delicious chips when prepared and seasoned correctly. Use potatoes fresh potatoes. The older a potato is, the more fructose and glucose buildup it has, which causes the chips to turn brown when they are cooked. 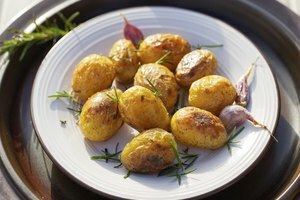 Pick potatoes that are not sprouting to avoid your chips having an altered taste, which can result from the internal starches present in sprouted potatoes. After the potatoes are evenly sliced, make sure the the potatoes are soaked thoroughly. This washes away much of the starches and helps increase the crispiness when frying the potato chips. Potato chips are known for their thin and crunchy shape, and this can be hard to do by hand. Purchasing a mandolin at your local kitchen supply store can save time in the kitchen. Another option for slicing the potatoes is to use a food processor with the slicing attachment. These might be thicker chips, but they will all be uniform as well. When rinsing and soaking the potatoes, use a ceramic or plastic bowl. Using a metal bowl may cause a slightly metallic taste to form in the water and the potatoes. Depending on the tools you have at home and your desired chip taste and nutritional content, potato chips can be deep fried or baked in the oven. Chips made in a deep fryer are cooked more quickly and have a more generous oil coating than baking. Oven chips will have a longer cooking time and less oil coating the finished product. The baking potato is the most common potato to be used for making potato chips, but other potatoes may be used as well. Each one will create a different type of flavor, and you may want to augment that flavor with spices. Russet potatoes are usually flavored with butter and salt. 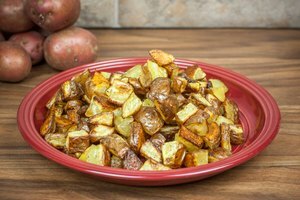 Yukon Gold potatoes have a milder flavor and benefit from seasonings that have a little more vigor, such as cumin, paprika or mustard. Fingerling potatoes tend to have a more buttery and creamy texture to begin with, so adding spices that complement butter, such as garlic or onion powder, is a good idea. 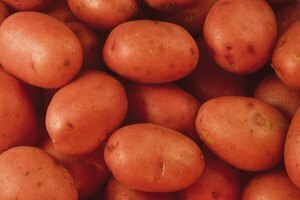 Red potatoes tend to have a much sweeter taste than other potatoes; adding a milder flavor, such as basil or oregano, will keep the potato chip from becoming overpowering.